Caprica, Helo and Caprica-Boomer keep running from the Cylons. At last we get back into space and have a few battles. Sending in fighters to destroy the Cylon base is just for effects, and some of them show their age. The better solution would be to emulate the beginning of Babylon 5. Just take a big rock bring it near the planet and let gravity take hold. Refa had developed a plan that would avoid major Centauri casualties by not landing an invasion army on the Narn homeworld; instead, a Centauri fleet would bombard the planet’s surface with large meteors fired from mass drivers attached to Centauri warships. The meteors would simply “flatten” Narn cities and civilization, and the Centauri could then land and take over whatever ruins were left. Following Refa’s plan, the Centauri fleet began to bombard Narn from space using the mass drivers illegally fitted to their battleships (mass driver bombardment is considered the equivalent of using Weapons of Mass Destruction in the Babylon 5 universe, with every major race having treaties against it). The mass drivers rained huge meteors down onto the planet’s surface, reducing most of Narn’s cities to rubble, killing millions of Narn civilians, and effectively shattering the Narn’s infrastructure and defensive abilities. Suspecting that Commander Adama may be a Cylon agent, President Roslin tells Dr. Baltar that Adama should be the first person to undergo the now-functioning “Cylon Detector” blood test, a process that takes eleven hours to complete. A lone Cylon Raider appears when Adama is suspiciously off-ship. A combat air patrol disarms it, but Col. Tigh deploys a Raptor to gather data on the enemy. Shortly after, Adama appears with Tigh’s estranged wife, Ellen, who everyone thought had died in the initial Cylon attacks. Adama is suspicious of her sudden appearance and orders Dr. Baltar to put her blood test ahead of anyone else’s. The plot on the Cylon Raider is superfluous as it just goes nowhere and the ship is destroyed. 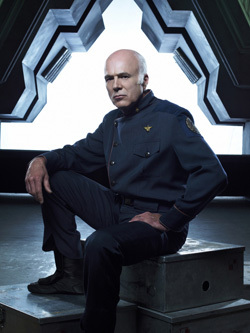 Tigh may be No 2 in command, but appears to lack discipline for the purpose of the story. His drunk wife just gets annoying. What they do with her in the future will be interesting as Tigh may resort to drinking again.